The Blade-Tech Total Eclipse Holster is truly one of the most innovative carry options on the market. Featuring multiple different carry combinations, including an adjustable cant, you can be certain there is a conversion perfect for you. Rounded edges eliminate pressure points for the lowest profile possible while providing comfortable all day carry. 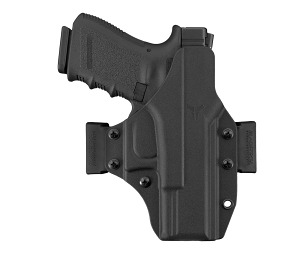 The IWB conversion kit for this holster features easy on/easy off belt clips, perfect for a busy lifestyle. The Total Eclipse Holster is precision-molded, out of highly durable material, to withstand even the toughest use. Carry Confident, no matter how you choose to carry, with the Total Eclipse Holster.